Pre-drawn UML class diagram symbols represent class, template class, object, item, package, interface, dependency, composition and association, etc. These symbols help create accurate diagrams and documentation. UML class diagram templates offer you many useful shapes. UML class diagram symbols like class, template class, object, item, package, interface, dependency, composition, association and more are available. Classes and interfaces in UML show architecture and features of the designed system. Aggregation is a special type of association in which objects are assembled or configured together to create a more complex object. An aggregation describes a group of objects and how you interact with them. Dependency relationship is a relationship in which one element, the client, uses or depends on another element, the supplier. Composition represents whole-part relationships and is a form of aggregation. Generalization is a relationship in which one model element (the child) is based on another model element (the parent). Association is a relationship between two classifiers, such as classes or use cases, that describes the reasons for the relationship and the rules that govern the relationship. 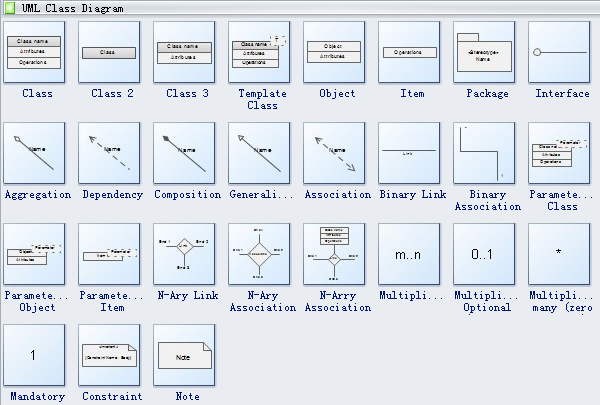 Edraw software provides you lots of shapes used in UML class diagram. UML class diagram shapes like class, template class, object, item, package, interface, dependency, composition, association and more are available. Need fresh looking UML class diagram symbols for your design? These UML class diagram symbols are a cinch to pop in. And their crisp, fine detail will make spectacular, easy-to-understand diagrams and presentations to your customers.